Hold nothing back in the Marchesa® Plunging V-Neckline Tulle Cocktail Dress. Illusion mesh with "V-neck" construction. Tied bow at the waist. Lining: 92% silk, 8% spandex. 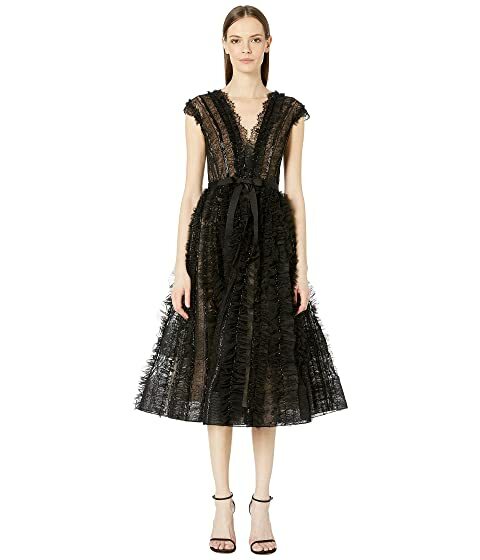 We can't currently find any similar items for the Plunging V-Neckline Tulle Cocktail Dress with Engineered Lace, Bugle Bead, and Tulle Ruffled Stripes by Marchesa. Sorry!